Central Idea:Making sensible choices about how we care for our bodies and minds helps us to thrive. Affects of exercise, rest and sleep on body and mind. Affects on self-esteem when making healthy options (food, exercise, emotions). What foods help me be healthy and why? How does exercise help me? Why do we need friends and family in our lives? Why do we need rest and exercise? 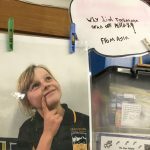 ACARA: Health and PE – person, social and community health. All places have special features that distinguish them from each other. What are the physical characteristics of where we live? What are the similarities and differences of places around the world? How can we describe the landforms and (geographical) features? How has the landscape changed over time. What is new, what changes can you see, what can you predict for the future? 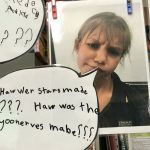 Here’s our latest student questions relating to our Inquiry topic……such a curious bunch of students!! Central Idea: People’s awareness of their characteristics, abilities and interests shape who they are as learners. Personal abilities and interests, ourselves as learners. Who am I? What are my likes/dislikes, strengths /weaknesses? How can I improve myself to be successful? What can I do to learn to the best of my ability and maximise my potential? How can I show and respect the differences & similarities in others? Concepts: Perspective and reflection. Identity, character, beliefs, similarities, differences, awareness of self, celebrations, classification, growth & explorations. Central Idea: Curiosity about the world can be discovered through observation, exploration and experimentation. 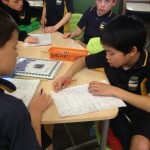 Properties of materials suitable for a specific task. Classifying, observing, reflecting & giving feedback on designs and finished models/creations. Designing, planning and creating skills. Central Idea: All places have special features that distinguish them from each other. The similarities and differences of places around the world. Central Idea: The products we use go through several stages from start to finish. Central Idea: People convey culture and beliefs through music, dance and visual arts. Cultural expression in music/ dance/ visual arts/ storytelling. We continued our investigations into materials, strength of shapes used in buildings and the ways that structures are built for the first 3 weeks of Term 2. Then we moved on to our next topic. Central Idea: Observing changes over time helps us develop a sense of history, including personal history. 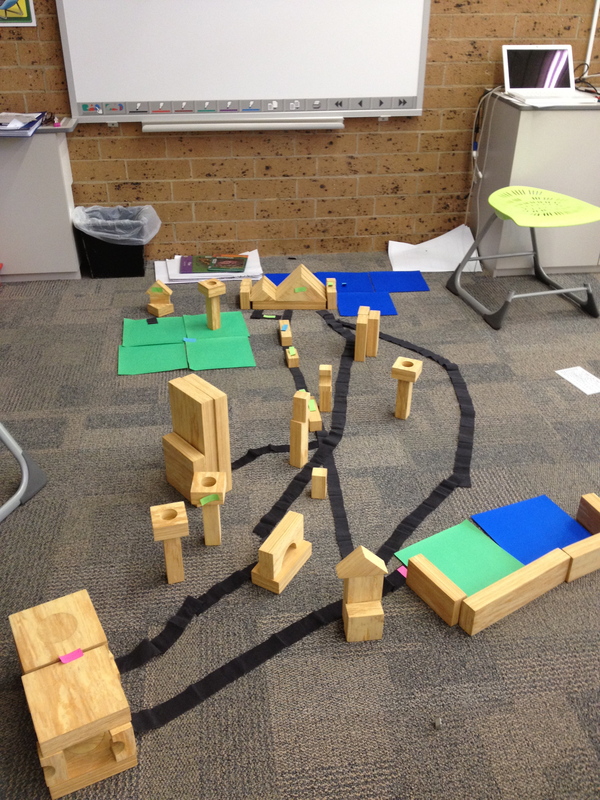 Central Idea: Geography, climate and the types of materials available determine the structures that can be built. What is the purpose of structures in our community and communities around the world? What are the essential features in different structures? 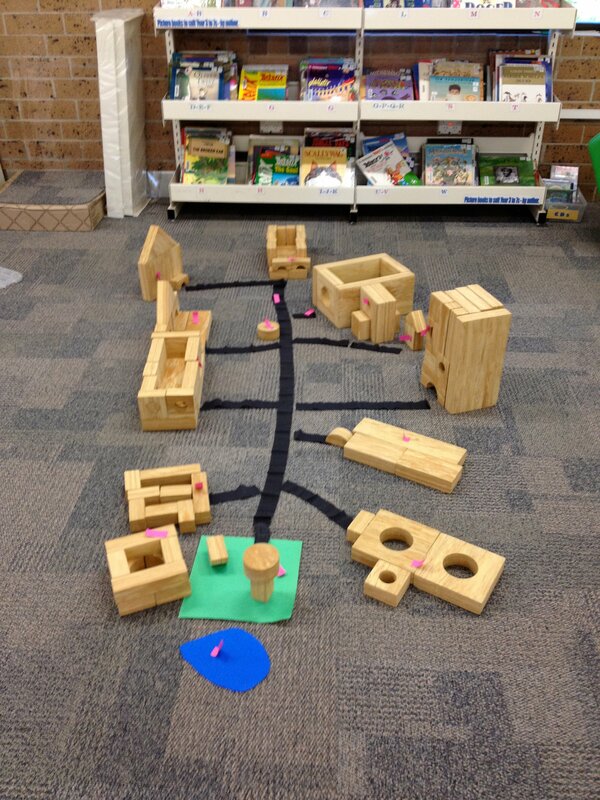 What do houses and other structures look like in our local area? Why are specific materials chosen when building structures? How do buildings in different climates change and why? Central Idea: Communities rely on people doing different kinds of work. 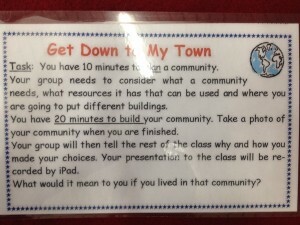 What are the roles/responsibilities at home, people in the school and greater community? Explain how people and technologies in systems (communities) link to provide goods and services to satisfy needs and wants. Central Idea: Making sensible choices about how we care for our bodies and minds helps us to thrive. Eating healthily and how it affects your body. Affects of exercise on body and mind. People convey culture and beliefs through music, dance and visual arts. Writing genre: procedure writing, explanation. Light creates shadows, reflections and colour that effects life on Earth. How can light be manipulated? How does light affect the world? Central Idea: Plants have specific needs in order to grow and stay healthy. Our responsibilities towards the plants we choose to grow. 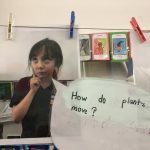 What do you need to grow a plant? What are our responsibilities to keep them healthy? 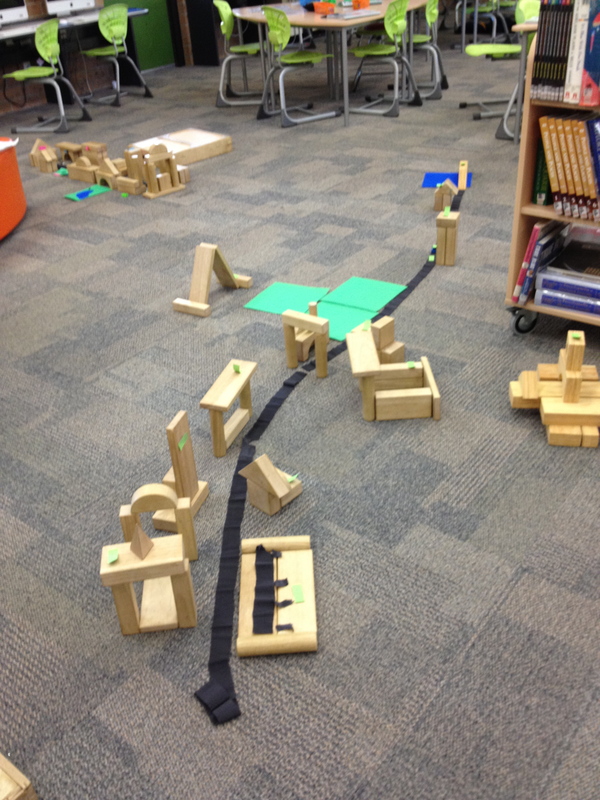 Central Idea: The properties of construction materials influence the design of buildings and structures. What materials/shapes are buildings made of? Why? 2. What properties do building materials have? 3. How have building materials changed over time? (look at origins & uniformity) 4. How do buildings stand? 5. Which materials make structures strongest? Last the longest? 6. Why do we (humans) create all these various structures? Central Idea: We need a healthy and well balanced lifestyle to have a healthy body and a healthy mind. Central Idea: People have different professions through which they interact. Steps of doing a specific job. How to work together towards a common goal. Central Idea: Understanding the interactions of living things in an ecosystem help us to make responsible decisions. How human activity affects ecosystems. People can influence the world in positive ways. Ways we can make a difference in the world. Cultures throughout the world have told tales as a way of passicng down their beliefs, traditions and history to future generations. Central Idea: The products we use go through several stages from start o finish. Central Idea: Water is vital to all life on the planet, but not all people have equal access to clean, safe drinking water. Central Idea: Different body systems work together to support our life processes. 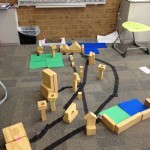 Central Idea: Structures are built with specific materials according to a process. What are the materials used to make structures? Why? 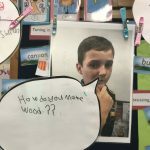 As a part of our current unit of inquiry we are investigating materials used in structures, why structures are built the way the are, what are some famous structures from around the world and why were they built and looking at the materials used in specific structures and why those materials were chosen. We are looking forward to lots of Technology activities using the design, make and appraise process to create and asses our models. With Mrs Langham, in the Library, we are investigating bridges – what types there are, why they were built and why specific designs were chosen. 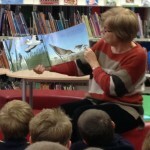 Here are some photos from our latest session in the Library. We had lots of photos of different bridges from around the world and our groups needed to sort them- by setting our own criteria to sort them. Then we did some reading about bridges and their forms and then resorted our photos. 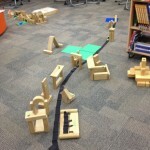 This created lots of discussions about the different types of bridges we had. As a part of our Inquiry unit about Safety we collected sets of pictures and photos showing safe and unsafe situations. What made it a safe/unsafe situation? If it was unsafe how could we change it become more safe? We shared in pairs and then groups of 4 and then changed our groups so we could see lots of different pictures and share our thoughts and ideas. At the end of our sharing session we placed our pictures onto a line from 1 to 10. 1 meant the photo showed a safe situation and 10 meant it was very dangerous. Then we did a gallery walk to see where the pictures had been placed. It was a really interesting activity to do. Here’s some photos of our session on Tuesday. Our first unit of inquiry for 2013. Central Idea: Making safe decisions affects our lives. We are looking forward to inquiring about ways that we can be safe, make safe choices, how to get help if we need it and how to make safe choices for ourselves. 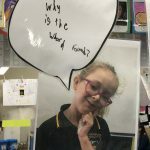 Last week our class members created posters that taught a lesson about water – we needed to use the information that we learned from this unit of inquiry. 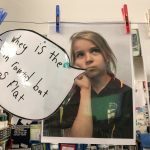 Our posters needed to have a clear message, the pictures needed to support the writing and we needed to take pride in the work we presented. 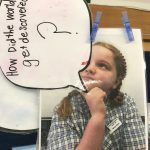 It was clear that the students who presented their work clearly understood the inquiry points from this unit and could thoroughly explain their learning. Great job guys! During the last few weeks we have begun answering the questions we posed on our “Wondering Wall.” We’ve used books, posters, charts, pictures, diagrams and internet websites to locate the “right” information to help us collect facts to answer our questions. Today we began planning how we would like to present this learning. We brainstorm a big list and then showed examples of what they could look like. 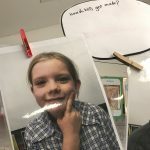 For example: posters, making a chart, making a mind map, using the StoryKit app or Cartoon Strips on the iPods or iPads, or using different programs on our computers like Keynote, iMovie, Pages. 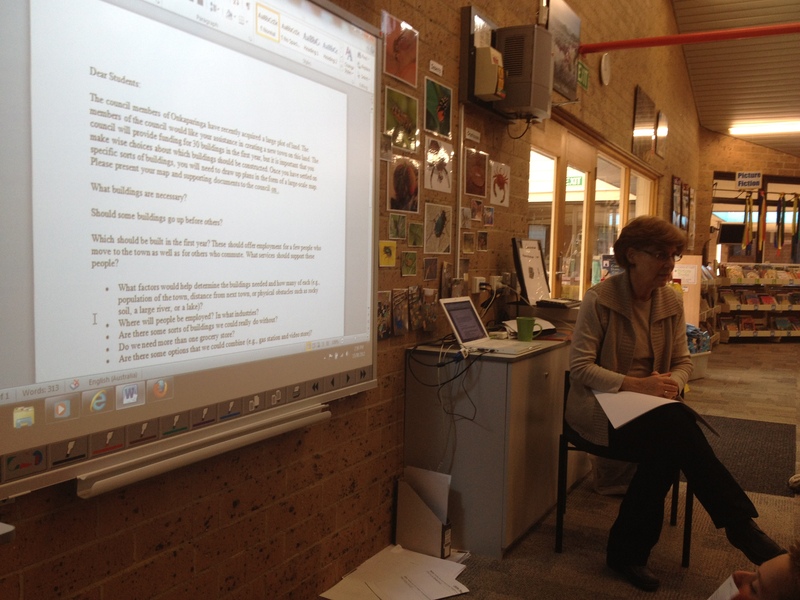 The room was just buzzing with excitement at presenting our learning in any way we wanted. We needed to record a plan of how we would present our learning and brainstormed a list of items that must be included in our presentations. 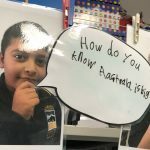 We need to include all our information, use diagrams or pictures with labels to match the writing, make sure our information actually answers the questions we asked and that our learning in presenting in an interesting way. Here’s our planning and first working session from today! and any wonderings we had from the picture. These photos really got all of us thinking about how we use and collect water all around the world. As a part of our new Inquiry topic we begun by using lotus diagrams to show what we know about the topic. We used the titles/ key words to brainstorm everything we knew about the topic. We shared our ideas in small groups and then the whole class. It created a really interesting discussion about Water. 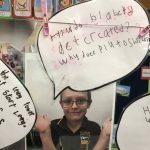 Then we began to ask some questions to about our topic and listed some key words for our word wall. 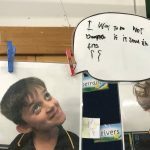 On Thursday Miss Sporn said we could make it rain in our classroom. Can you believe it?? We used a kettle, boiling water and trays to catch the water/ condensation. We watched the water heat, steam began to rise and then formed on the surface of the tray- as condensation. Then we looked at how this links to the water cycle. 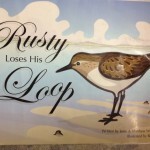 Then Mrs Langham read us a story book called Ruby Loses His Loop. 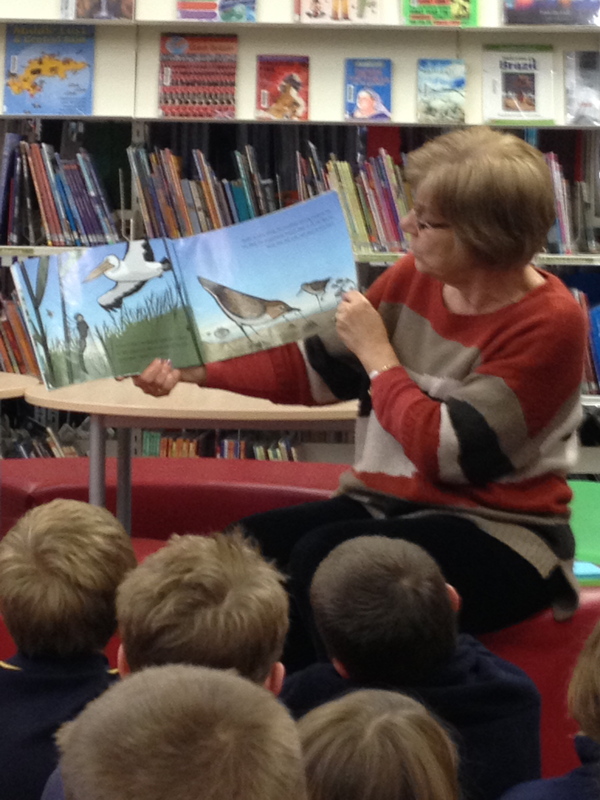 We discussed the story and how water affects bird life – plus any of nature’s creatures. 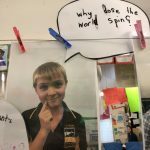 Our new inquiry topic starts this week. Water is essential to life, and is a limited resource for many people. The importance of clean drinking water. 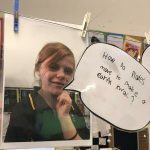 Why do we need water and how do we use water? What are responsible ways to use water? What can we do if we don’t have access to clean drinking water? Nature and the Development of science: Identifying and describing sources of water. As our final learning task we were presented with a challenge. Task: Create a new community that services the needs and wants of the people living there. You will need to discuss, plan, map and create your community – considering all of the needs and wants of the people who are going to live there. Your group will present it’s community to the others in our class- all group members need to be included in this presentation. Here is a video of the girl’s community called Willowsville. The girl’s really explained their community very clearly. They co-operated very well as a group and always listened to each other and shared ideas clearly. Their explanation shows just how well they understood the needs of the people in their community. A wonderful effort girls! You worked well as a team and your creation of Willowsville really showed what you understood about the needs and wants of a community. 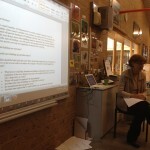 These are some snapshots of our planning and building sessions. This was a part of our final assessment piece – to show what we’ve learnt about community – needs vs wants, planning a community, mapping skills, how to come to an agreed decision (like Councils do for communities that they serve) and actually starting to build models of the buildings and services we would need. 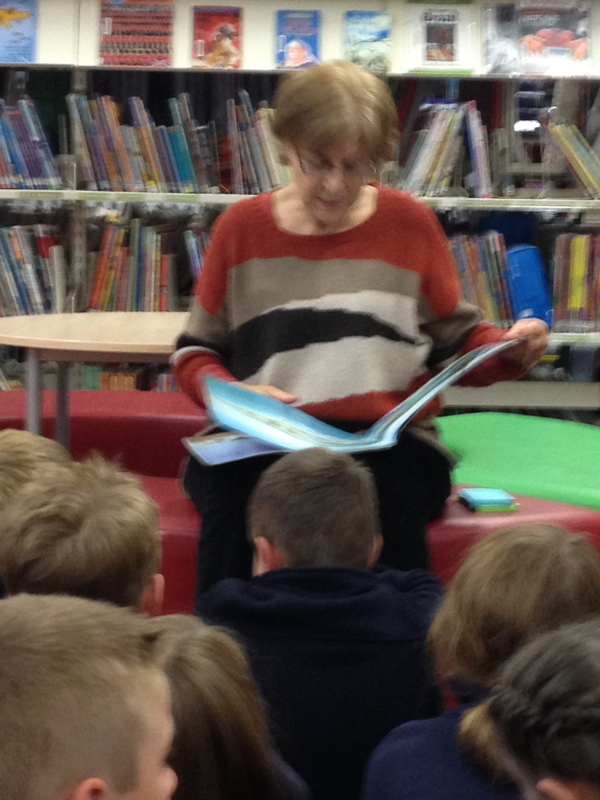 We have continued our work with Mrs Langham from our Library. 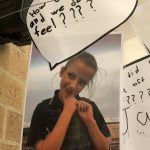 Our investigations into communities, resources, services and systems have continued and we’ve been posting lots of big, fat juicy questions on our student question board. You and your partner have to build a new community. You must include 30 buildings that will suit the needs of the people wanting to live there. What will you include and why? 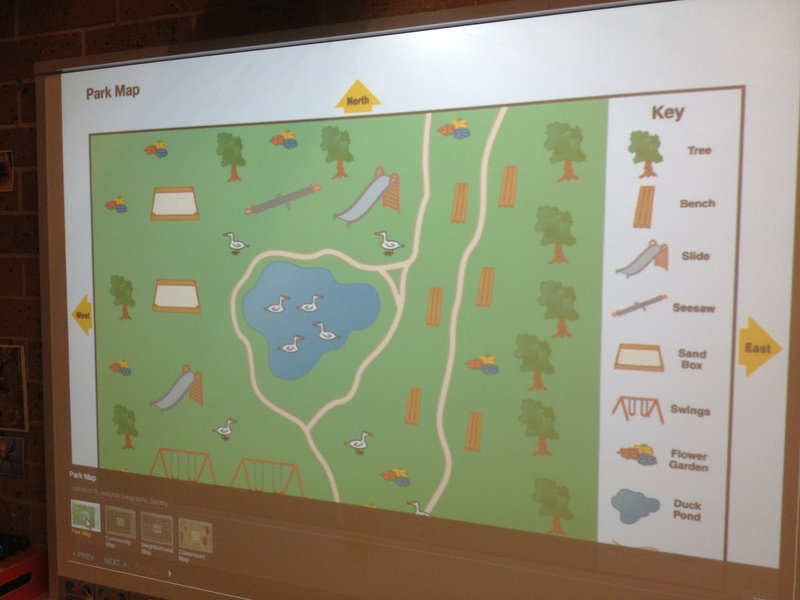 We looked at some different planning maps, showing a bird’s eye view and we looked at the keys or legends used. 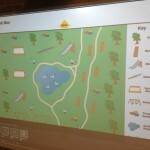 We used the National Geographic Education website for some ideas. We planned and listed what we would like to include and needed to give the reasons why we had included them. It created lots of interesting discussions. Here are some photos to give you an idea of what our session looked like today. 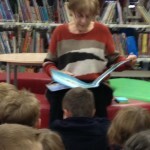 As a part of our Inquiry unit today we worked in the Library with Mrs Langham. We made groups of 4 or 5 people and all received the same task card. 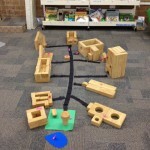 During our 10 minutes planning time we created maps, using a bird’s eye view, and listed different needs of a community – buildings, resources and services. 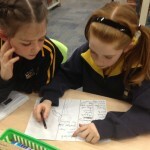 Each group shared their plans and then some groups added ideas to their plans. Next we had 20 minutes to build our community. 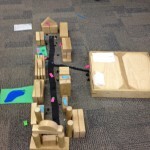 It was a busy and frantic time for each group to get their community built on time. 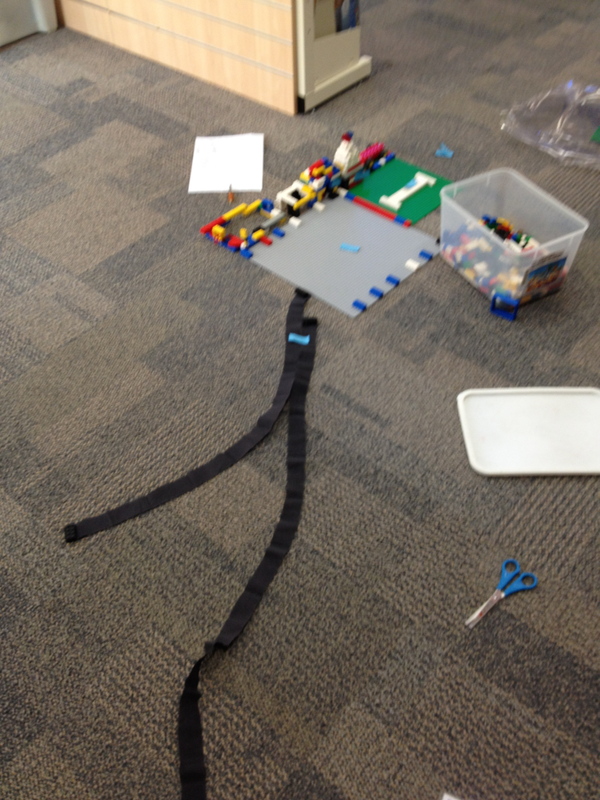 We used blocks, foam shapes, books, Lego, crepe paper for roads and brennex paper for water or green paddocks. It was really important that our groups co-operated, shared, compromised, took individual responsibility for their part of the team and helped each other. Most importantly each group needed team work. 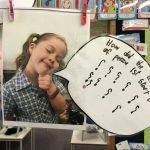 Here are some photos showing our learning. 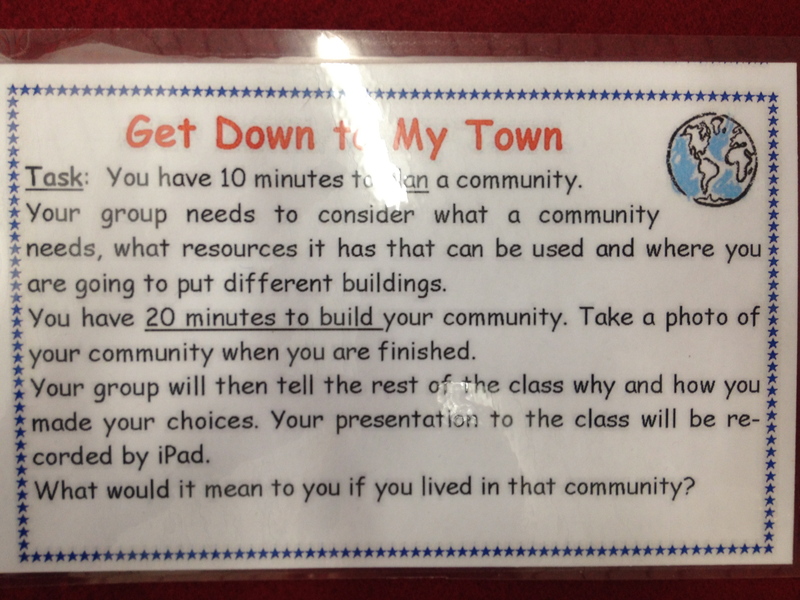 Then each group needed to present their community to the rest of the class. We gave each group feedback, asked questions and clarified what we were looking at. Here are the finished communities. Each group’s video will be posted on this page – soon! 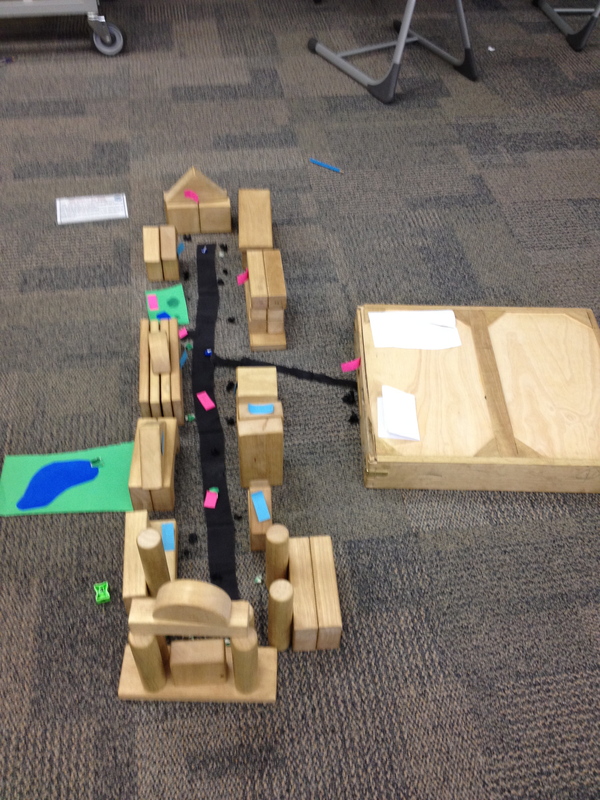 As a part of our Inquiry unit about communities, systems in communities and the resources we need we brought models from home to show the different types of buildings in our community. 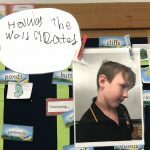 Here’s a slideshow to show our models – we have the most amazing models on display in our classroom. Pop in and see them when you can. 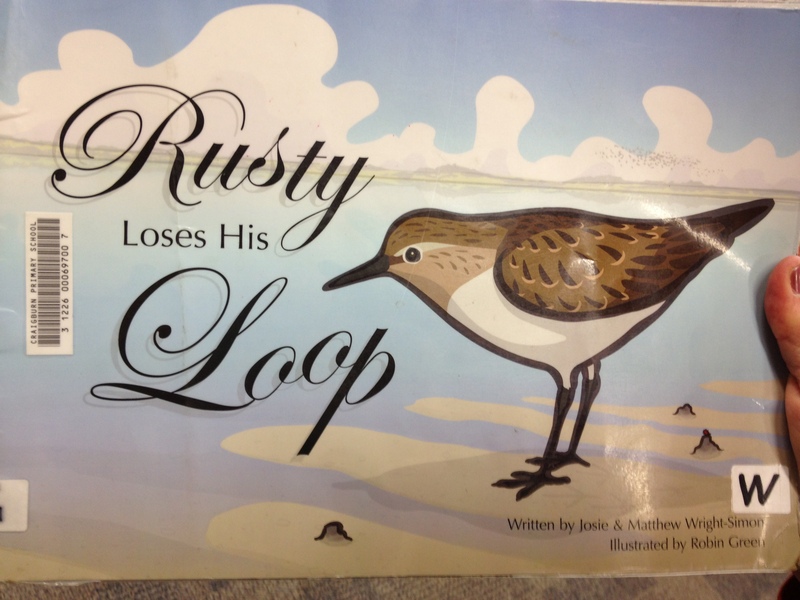 This week we started our new unit of inquiry. It is called Get Down to My Town. The central idea of this unit is: A community is made up of people and places and the services and systems that operate within them. The effects planning has on a community, both good and bad. 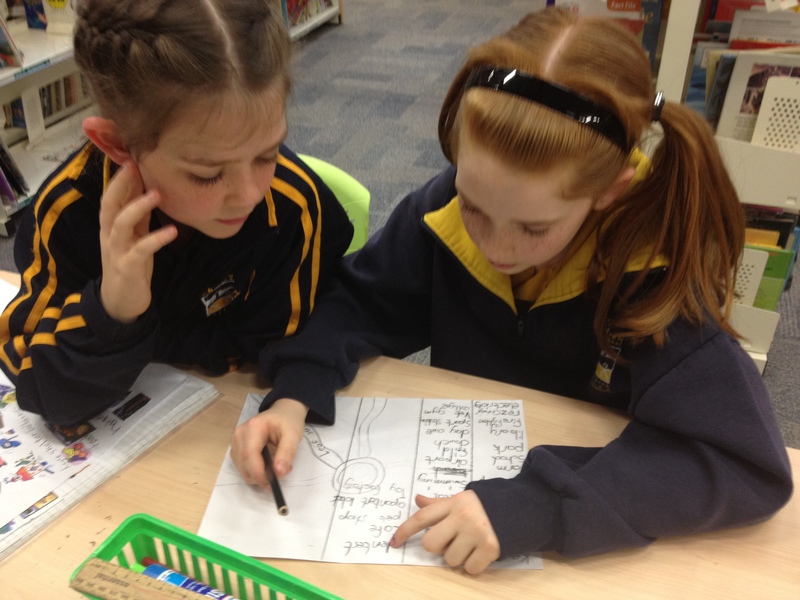 We started our investigations with a mind map to show what we already know about the topic. Then we worked with Mrs Langham in the Resource Centre and used ‘placemats’ to discuss photos from Google Maps. What needed to record: What we could see, What it made us wonder, What is reminded us of and ask How does it…? We had some interesting discussions about all of the details we could see on the maps. Then we brainstormed our Top 10 parts in a community and then we wrote the most important idea into a sentence and explained our thinking and ideas. As a part of our inquiry into the qualities and values of a hero our Sharing Time topic was to create a model or drawing of a medal you would award to an Olympic athlete. We needed to include a model or a drawing of it, a description telling us who could win the award/ trophy and explain the values and qualities that each athlete would need in order to achieve this. It was a really interesting Sharing Time topic. We had lots of different sports represented and the trophies and drawings were really creative. 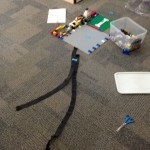 Here are the photos of our ideas! 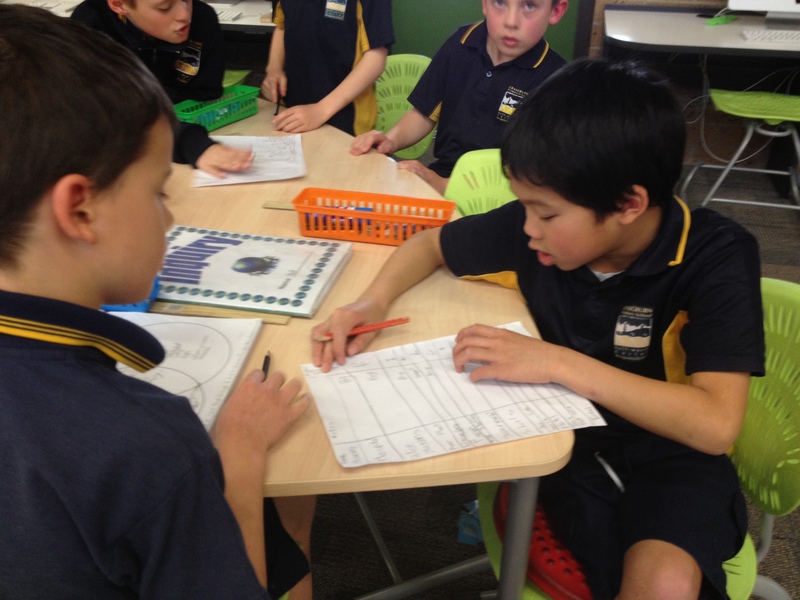 As the presentations were made during the week we noticed that many qualities were similar. Tell us what you think of our trophies – we’d love to hear from you! Today we saw the Camp Quality Puppet Show at school. The play was about a little girl called, Kylie, who had cancer and had chemotherapy as her treatment. Kylie met her friend Deano after she had finished her chemotherapy treatment. It was Kylie’s first day back at school, after being away for 3 months. Kylie felt very nervous being back at school and how she looked now after her treatment. At first Deano teased Kylie because her hair had fallen out and she looked as pale as a ghost. Kylie was also very skinny. Kylie’s feelings were very hurt when Deano teased her. BUT Deano realised his mistake and knew he needed to apologise. After Kylie had explained her cancer and the treatment Deano said sorry and that made Kylie feel a lot better inside. Deano realized that it doesn’t matter what you look like on the outside – it’s what’s in the inside that counts. We really enjoyed the play and we learnt a lot about cancer and how to treat it. We also learnt some important messages about not teasing people and treating them fairly. ➢ It’s not cool to be cruel! One of our tasks this week has been to create a “comic book hero.” Each description needed to include the characters name, their strengths and the skills they possess. We then needed to write a 6 pane comic strip showing this character at work. Here are some of our finished pieces of work. Thanks Brodes – can you think of a name for it??? Plus click on the pencil in the corner and you can feed the penguin!!! I’ve got a name for it bob. Matthew, I think that is a good name. I also thought of the name ICY. I like punching Icybob and I like giveing him some fish. Good work guys all of your structures were excellent!!!!!. WOW!. I like the posters that tell you what is bad and what is good. I think your inquiry unit is fantastic!!! Hi evryone your brochures are looking great they all are very creative. 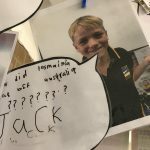 I like this kind of inquiry unit! 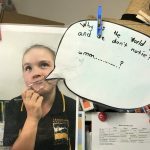 This blog is great because I learn all about your busy day at school, Emma!! Class-I love the idea of dream structures, especially Trent’s marshmallow structure-YUM!!! It reminded me of a Fairy Tale about an edible house…..I wonder if all great inventors of structures began with a dream. Hmmm….. The inquiry unit looks loads of fun and you all look like you are enjoying yourselves. gosh! all you guys are so clever on the computer! I’m just trying this for the first time and if it works please all wish Jordan a Happy Birthday today 1st November! It looks like an interesting inquiry unit. 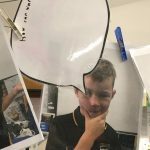 I loved doing Inquiry because you can learn about new parts of your own body parts. Sienna’s godfather Matt is a fireman. He worked very hard to become a fireman. Before becoming a fireman he was a baker, and then a tree arborist (someone who chops or trims trees), so he’s a man of many talents. He loves his fireman job the best though, because he gets to make a difference in people’s lives (he has saved quite a few people from burning buildings). We had fun talking about heroes in our community. Maisie had lots of ideas of people that are heroes but we were not surprised that she chose an RSPCA volunteer. I love animals so I chose an RSPCA volunteer. 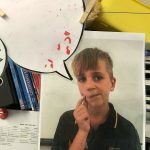 I want to show the class my hero who is not in our community. I wanted to do about my hero Alan Shearer the soccer player in England but Maisie would not let me. 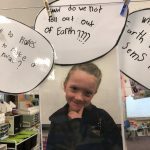 Looks like you had a lot of fun over the last few weeks in Inquiry. Chloe and Sienna hope you had lots of fun building your models.